It is the only trial site in Washington, Wyoming, Alaska, Montana and Idaho. The valve, compressed inside the catheter, is threaded into position and then expanded with a balloon to its full shape. For decades, stiff and leaky aortic valves were the sole provenance of surgeons – and with very good patient outcomes. Since 2010, though, clinical trials have shown the effectiveness of a prosthetic valve that a cardiologist threads into the heart via a catheter and unfolds, like origami, against the wall of the original valve. The patient avoids the trauma and longer recovery of open surgery. 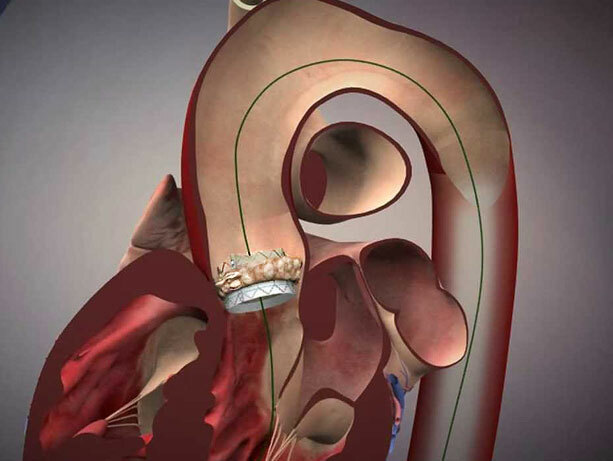 Nicknamed TAVR (transcatheter aortic valve replacement), the procedure went through two earlier stages of testing, first with patients too sick or fragile for surgery and then with those who would qualify for surgery but be at great risk. Very favorable results in those trials led to the current test, among patients so otherwise healthy that their only option was surgical valve repair. McCabe described this group as people in their 50’s, 60’s, 70’s and even early 80’s who are robust and vibrant except for the faulty valve. “These people have been asking us for the catheter procedure for a few years, but we’ve had to turn them down,” said UW Medicine cardiologist Jamie McCabe. “We couldn’t legally offer the device because they were too healthy," said Dr. Jamie McCabe. Because surgery is standard for these patients, hospitals might hesitate to advise patient candidates about the TAVR trial, he suggested, lest they lose the insurance reimbursement for a high-cost surgical procedure. McCabe is eager to get the word out about UW Medicine’s involvement in the trial, which will measure whether TAVR yields outcomes as good as, or better than, surgery. He thinks it will define how aortic-valve repair is performed for the next decade. He is obligated, though, to tell interested patients that the trial randomly assigns subjects to one treatment or the other. Study candidates "have to be open to the possibility that they will be randomized to surgery," McCabe explained. "There’s no guarantee they will get the catheter procedure." The trial involves a third-generation valve from manufacturer Edwards LifeSciences. This iteration has a cloth cuff that wraps around the valve’s tubular, metal alloy frame and acts as weather-stripping to better seat the prosthetic valve against the walls of the original. It has achieved excellent results with higher-risk patients, McCabe said. TAVR involves a one-eighth inch incision in the groin, near the hip. It takes about 35 minutes, and is done with the patient awake but sedated. Recovery time is short: 80 percent of patients go home the next day. Open surgery to replace an aortic valve takes two to three hours and involves a long midline incision and splitting the sternum to access the heart. Hospital recovery is five to six days. Patients must take it easy for about eight weeks while the breastbone heals, and it can take a couple of months to feel normal again, McCabe said. Interested potential trial subjects may seek information from Kate Jordan: 206.616.6768 or jordank1@cardiology.washington.edu.